Sharp Focus, Boost Mood And Ignite Potent Intensity! Blood Flow And Aerobic Threshold Extention! Halostachine HCl: Halostachine or N-methylphenylethanolamine is an alkaloid and has a very similar structure to thermogenics. It is also a metabolite of phenylethylamine (PEA) a compound found in cocoa beans known for its “feel-good effects”. 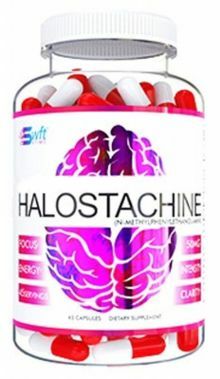 Halostachine acts as a beta-adrenergic receptor agonist similar to that of high stimulants but with a tone down in potency. That being said, you need to respect its power. Halostachine users may find a sharp increase in energy and motivation while not having to endure any jitters and anxiety common with many stimulants. Halostachine undergoes rapid metabolism so the effects are felt very soon after the dose and remain constant throughout the workout. As a B2 Agonist, Halostachine may aid in blood flow to the muscles under stressed conditions as well as increase oxygen availability. This better equips the muscles to perform in situations where you are trying to close out those last few reps.